Are you looking for a very fast motorcycle that you can use for racing or even for leisure riding? The Yamaha V-Max, introduced in 1985, is one of the fastest motorcycles around. The term V-Max is short for Velocitus Maximus. This is a heavier bike that is not recommended for beginner riders. Instead, it is a solid machine built for the experienced rider who is looking for speed to add to the excitement of riding a motorcycle. Since its introduction, this model has continued to be a top seller. Many people consider V-Max to be synonymous with top speed. The most amazing feature on the V-Max is the V-Boost, raising the power to 800 RMP. There are four downshift carburettors that feed the cylinders. Each one is separated by butterfly valves. The amount of horsepower the V-Boost adds to the motorcycle is something other hot rod models just can’t offer. This feature also allows the V-Max to accelerate quickly and smoothly. The first V-Max in 1985 offered a 145 HP and V-Boost. It came with a V4 1200 CC engine. This model was only introduced in the United States. Yamaha releases a slower version in 1986 to Europe and France, offering a 104 HP. The Europe models did not feature the V-Boost. The design was slightly changed for 1990 including a digital electronic ignition. This was the first year the V-Max was offered in Japan. Changes had to be made to the European model as they were enforcing stricter noise restrictions. In 1996 Yamaha decided to switch to a black exhaust system. It wasn’t as well received as they had hoped, so the design was switched back to chrome for the 1998 model. While some motorcycle enthusiasts find the V-Max to be much too powerful for their likings, those who own them are very proud of their bikes. The V-Max Owners Association features thousands of members from around the world. They also schedule racing and motorcycle rallies for their members. The Yamaha V-Max has found its way into the heart of drag racing as well. Many competitors find this bike offers them a great chance of winning as it is fast and reliable. It isn’t uncommon to see modified V-Max bikes in major competitions, clocking more than 200 miles per hour in the quarter mile. The Yamaha V-Max has been a hot selling motorcycle since it was introduced in 1985. Just looking at the bike, you can see the power behind the design. The black and chrome colour gives it a very muscular look. For some V-Max owners that have been the only drawback. There is no originality when it comes to the colour of the motorcycle. However, many owners of the V-Max have enhanced theirs to make it unique. This has been done by adding a different exhaust system as well as pegs. Some have even added small decals to areas including crossbones or another graphic. Others choose to replace the factory mirrors with shorter, stockier versions. Other consumers complain that the seat isn’t comfortable for long rides, choosing to exchange it for a softer and wider customize seat that is. 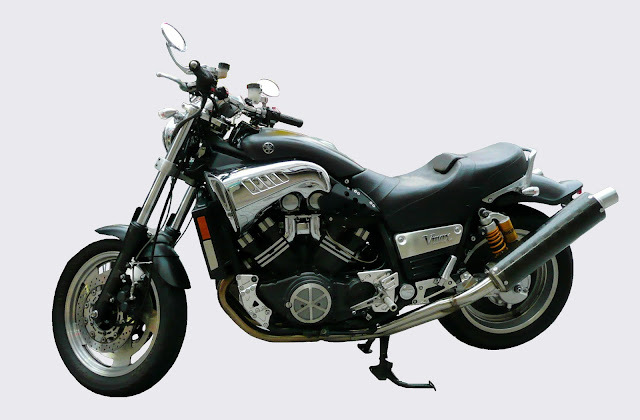 If you are looking for a hot rod motorcycle that is durable as well as fast, then check out the Yamaha V-Max. The 2007 models appear as hot as ever, and the speed is still above what you will find from many motorcycle competitors. The biggest change for 2007 is the model will move away from its trademark black and chrome look. Instead, it will feature red with white. Yamaha has made history with the V-Max, as for more than 20 years this bike has been viewed as the hottest muscle bike on the market. It has proven to deliver from looks to performance along the way. Perhaps the biggest surprise of all is the moderate price of this high-performance motorcycle, starting around $12,500. Yamaha also offers a full one year warranty.